Originally published by Azadi squat facebook page. Today in the morning around 5am about 200 Cops runned into the Squats and violently evicted them! Still now they are in Tzavella street and they close the houses with metal. This morning the police evicted Azadi Squat and our neighbors from New Babylon! About 120 of people have to struggle again! Have to sleep in the street! Our families of the house luckily didn’t had much repression! But some went to the police station! Other have to struggle and need sleeping places! About 90 Person are persecuted. 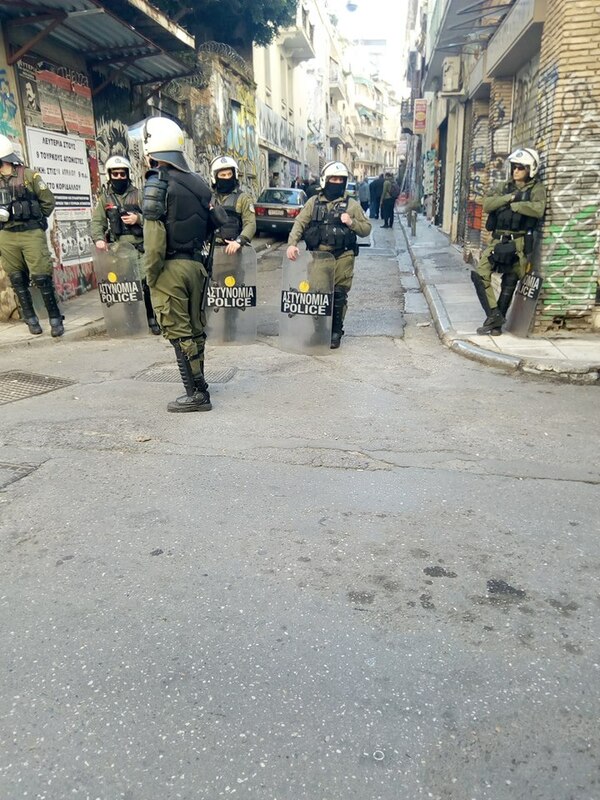 Police used violence- but the residents of the Squat was calm and didn’t resist! Now the doors are closed with lots of metal – but this doesn’t mean that we stay outside! We will find new houses! As long as people are left alone there will be resistance! And we keep fighting against borders – for freedom of movement! This eviction was a planned action and used for propaganda for the coming election as well! A lot of journalists were there from beginning and questioned passengers and stores around about this two Squats!